If you look over the stores and restaurants in Itaewon, you can see one of Seoul’s most iconic structures, the North Seoul Tower. It stands on one of the mountains that surrounds the city and looks over the action from all of its neighborhoods. During the four years I have lived here, I have seen this needle guarding the city, and I have always talked about eventually making it up there one day. I waited until yesterday to finally make that dream become a reality, and I discovered that after all of the palaces and the Buddhist temples, and tall buildings I have been to while out here, that this is, by far, the most touristy thing that I have visited in Seoul. Getting to the tower is not that difficult. You just take subway to the Myeongdong Station, and get out through exit three. Find the Pacific Hotel, and take the road to the right of it up the hill, and you will eventually find the mountain that the tower is on. There are two ways up the mountain, you can take the stairs up or you can take a cable car. I took the cable car, and I would recommend taking the stairs. I went to the tower yesterday because I thought that a lot of Koreans would be at home preparing for the Lunar New Year holiday so it would not be that busy, and this might have been the case. It was still really busy though, except not with Koreans. Apparently when people from South-East Asia celebrate this holiday, they decide to go the touristy thing in Seoul. February is not the best time to be in Seoul. It is really cold, and there are no leaves on the trees. Yet they were all here anyways. 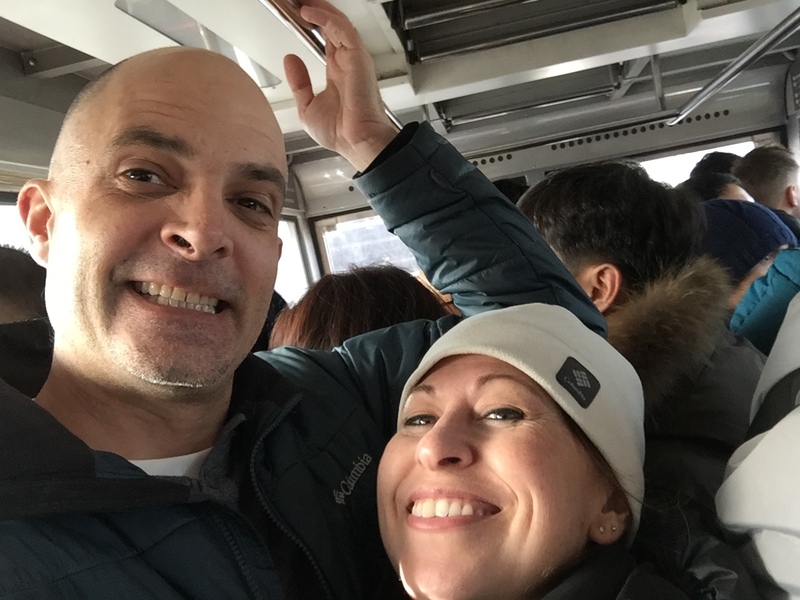 We stood in line for twenty minutes to buy tickets to stand in another line for forty minutes to get on a cable car that was way overpacked with people to take a ride up a hill to see the views from up top. It would have taken fifteen to twenty minutes just to take the stairs up to the top, and the exercise would have been worth it. Once up there, the views were really worth it. 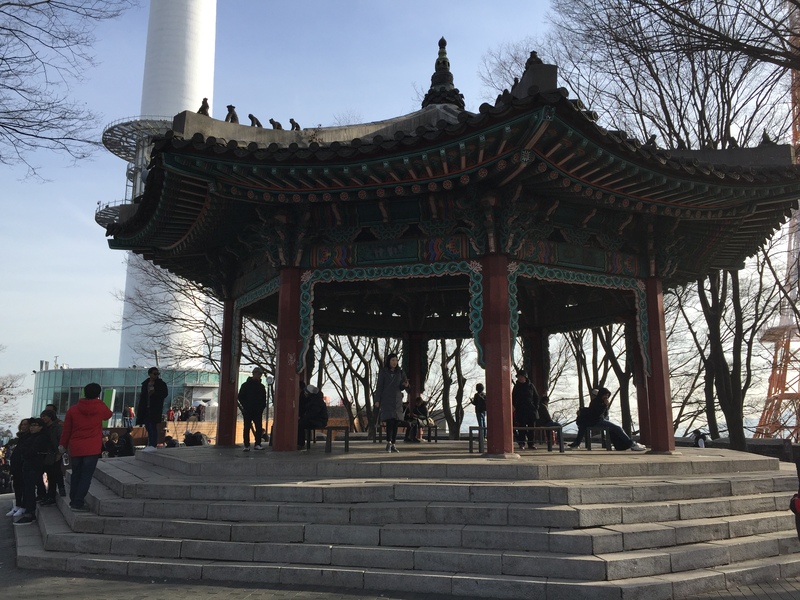 The North Seoul Tower sits in the perfect spot to walk around and see all the different nooks and crannies of the city. There are also a lot of fun things to do that highlight the Korean culture, from looking at old structures from the Joseon Dynasty to a lot of booths that teach people how to play the traditional games from tuho to yunnori. There were plenty of things to keep me occupied up there. Of course, it is also a big tourist destination, so there are a lot of companies that wish to take advantage of this fact. There are plenty of restaurants to eat at, and a couple of bars as well. There are numerous statues of Korea’s favorite cartoon characters so they can take pictures of them with their children. And of course there is a whole wall dedicated to love locks. This tradition that started in Paris has found its way all around the world. Young lovers will buy a lock and attach it to this wall then throw away the key. The idea is that the lock represents their love, and by throwing away the key then their love will always be eternal. It is a romantic idea, but it loses its power when their is a vending machine selling locks, and everybody believes that they have to do it. The idea starts to drift over to that love of capitalism idea instead. 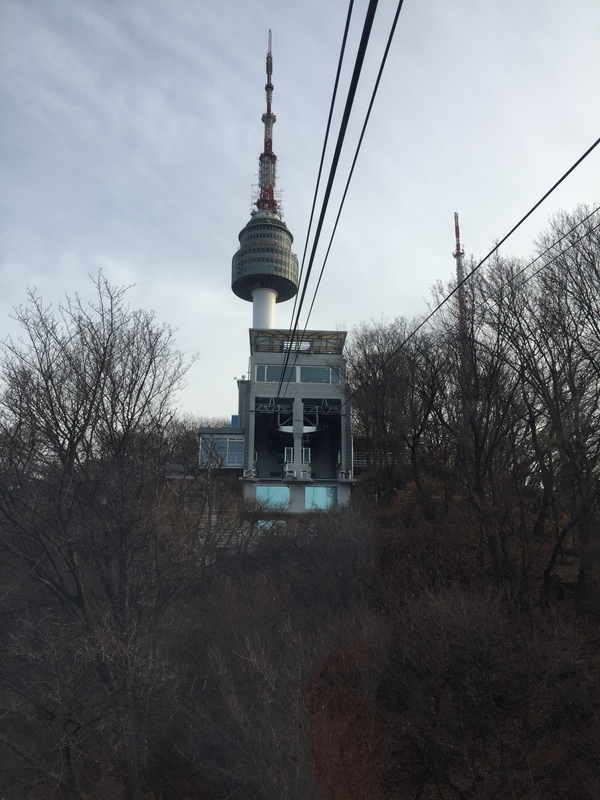 Despite it obvious tourist appeal, visiting the North Seoul Tower was worth the adventure, and I am glad that I took the time to go out and do it while I am still living out here. 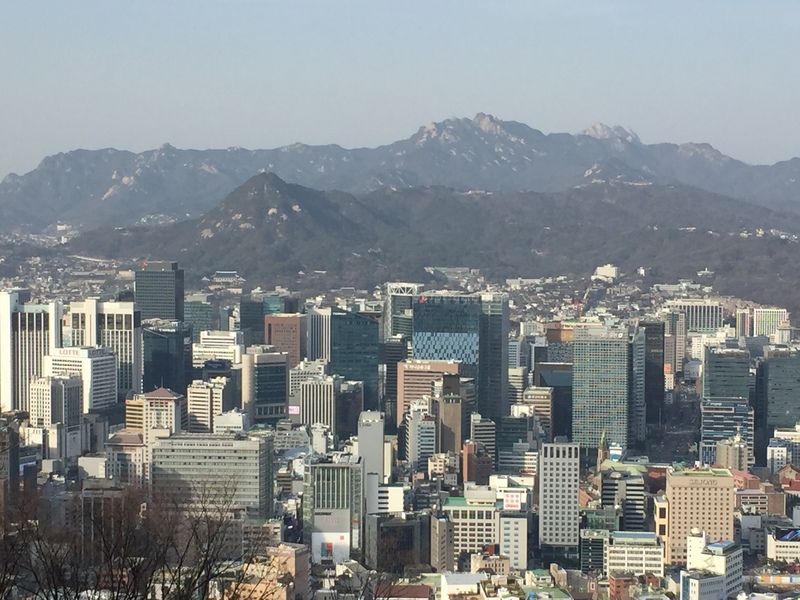 One of the things I have learned while living in Seoul is that South Korean look at the world differently than pretty much any other culture I have experienced. 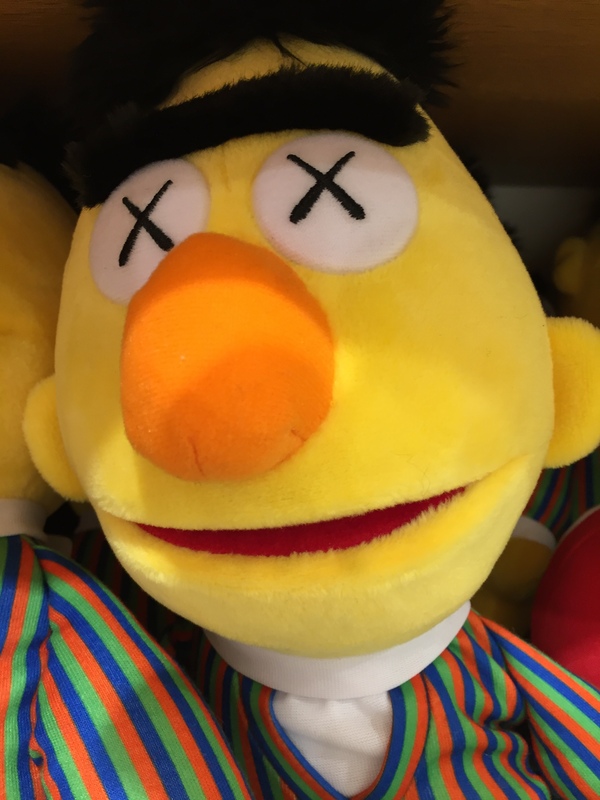 For example, right now, it is very popular with the youth of Korea to wear clothes that depict the death of the beloved Sesame Street characters. I don’t know if they even know what Sesame Street is, but they really want to see all of their characters dead. In a way, it is disturbing, but I think that they think it is endearing. Not all of the things that they enjoy are as creepy. They are definitely a coffee culture, even though this is not traditionally what they were. There are numerous cafes out there, most of them, the typical cafes you would find in any other place in the world, including the over-saturation of Starbucks, but they have specialty cafes as well. There are board game cafes where you can go and play any of the games that they have on the shelf. They also have ones that allow you to play with legos, or rest in a fake indoor garden. These are all popular, but the most popular of them involve animals. 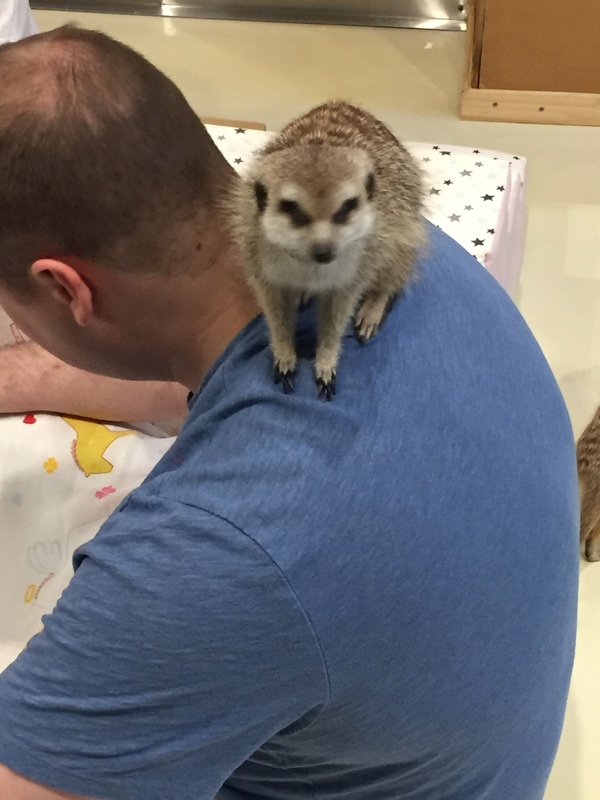 There are cafes where you can hang out with dogs, or cats, or even goats, but the one that I went to yesterday let you hang out with meerkats, Meerkat Friends. It is not in Itaewon, but it is only a fifteen minute subway ride over to the Hongdae neighborhood. It is the perfect way to spend a wet and rainy afternoon, and it is a thing that is typically Korean. It costs 12,000 won to enter the cafe, and they serve a variety of drinks there even though nobody really buys any of them. You then get the opportunity to sit in a pen with a herd of meerkats that crawl all over you, and nestle close so they can get in a quick nap. They let you stay in there for ten minutes at a time, but then there are other animals roaming around the cafe that allow you to play with them as well. 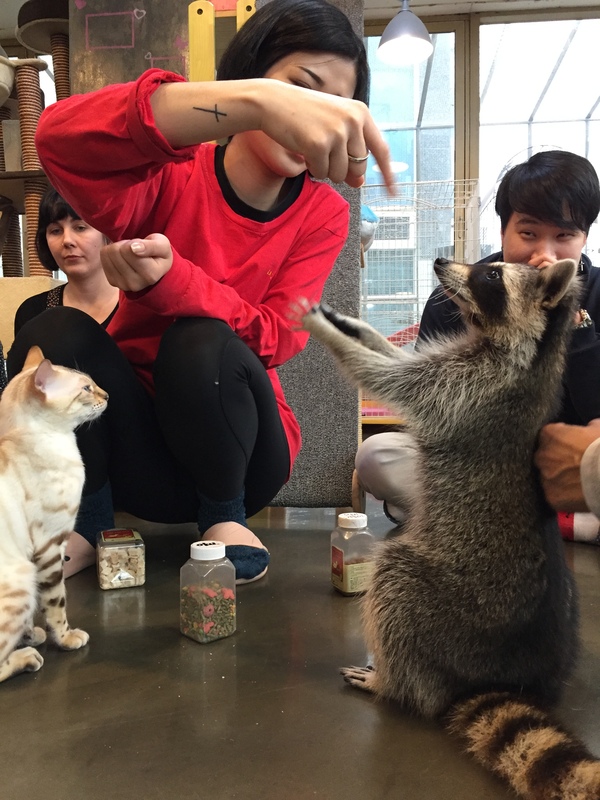 They had a couple of cats, a couple of foxes, and a couple of raccoons. It was a fun experience, and we quickly lost track of time as we played with the animals. If you do come out here and want to visit one of these cafes, I recommend that you do your research on the places first. There are a lot of cafes that house animals, but not all of them are kind to the animals that they have. 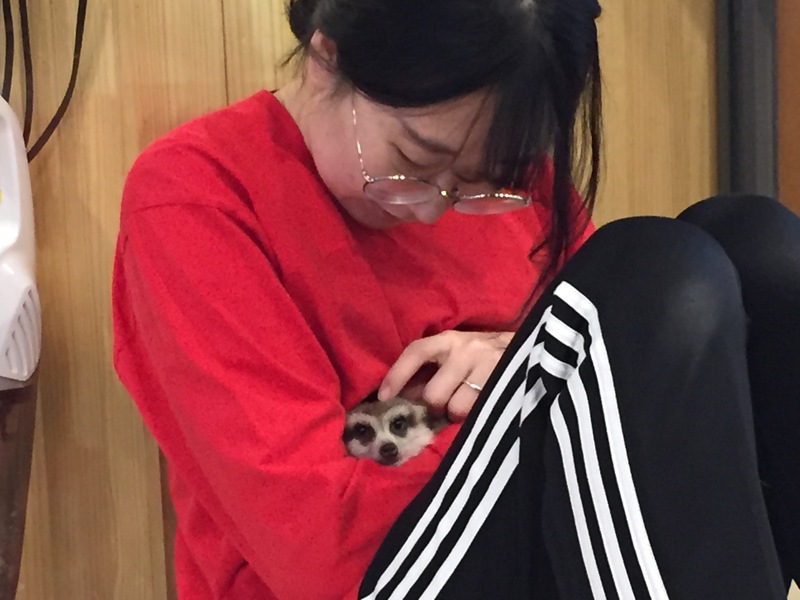 Meerkat Friends does a great job of caring for their animals, and it is almost as if they twenty pets that they get to play with every day. If I wasn’t a teacher, this is the kind of place that I would look to work at because it would be fun to go to everyday. It was fun to go to just for one day, and it is a place that everyone should seek out if they ever find themselves in Seoul. I know it is going to sound like I am the laziest person on Earth when I title my post “Escaping the Grind” three weeks after just having a long Winter Break. How much of a grind could I have been through in that short of a time? It is true that the semester has just started, and we have just gotten into the work that we need to do, but a very important holiday, Lunar New Year, has come to Korea, and the school has given me a five day weekend. Of course, I will take advantage of it, and go to downtown Seoul and see some of the sights. I am also an English teacher, so I never get to completely away from the grind. I have brought a stack of papers with me that I need to grade, and there is some lesson planning I need to do, but I do get a little extra time to enjoy life a bit. I am not the only one getting away from the grind either. Everybody in Seoul has travelled to the smaller towns and quiet corners of the city to celebrate the holiday. Lunar New Year is a huge family holiday in South Korea, and people will travel to the locations where the head of their families reside. That location is never inside the city itself. 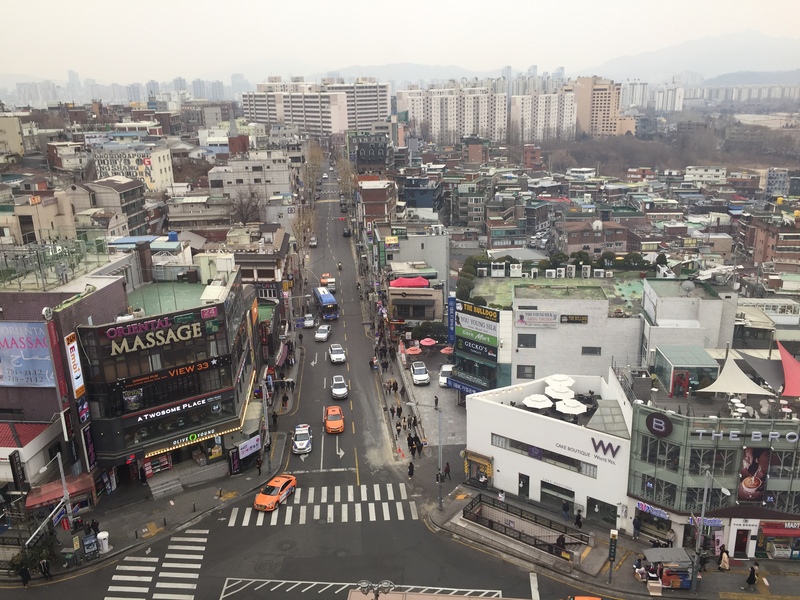 In fact, Seoul clears out quite a bit, making it the perfect time to go downtown and see some of the sights. 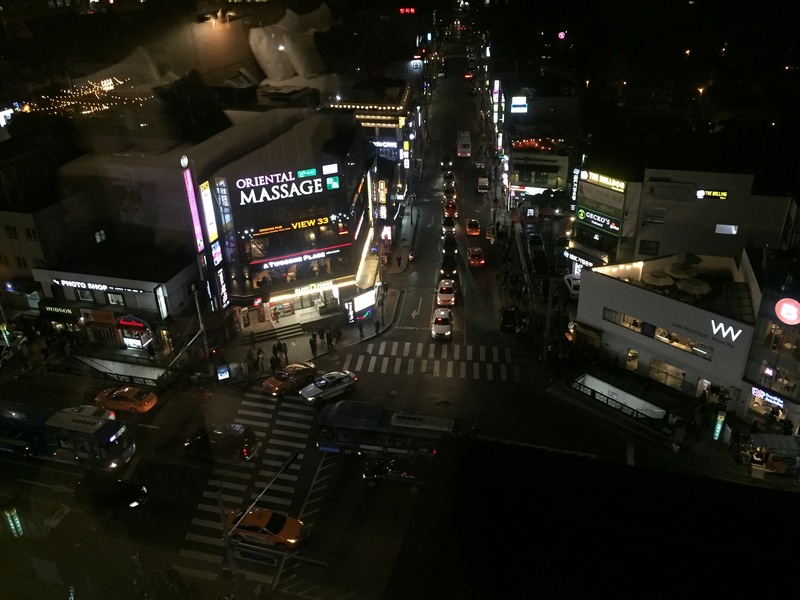 One of my favorite places in town has always been the neighborhood of Itaewon, and I have made this my little destination for the next couple of days. 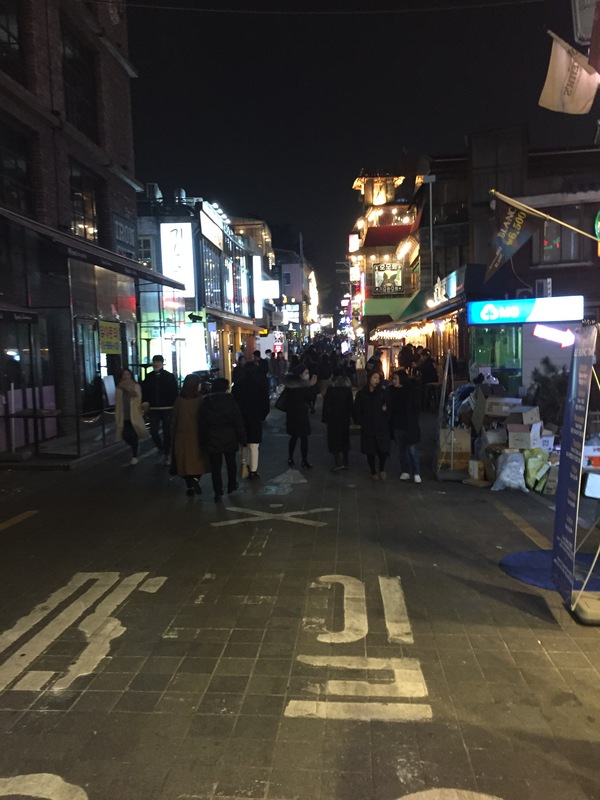 Itaewon is probably the most international location in Seoul. It is close to Yongsin Military Base, and because of this, many of the soldiers and people who work there come to this spot to unwind and have a good time. There is a plethora of restaurants that range from Italian and Mexican, to Middle Eastern and Thai cuisine. There are lots of shops selling sports gear from the States, a variety of vinyl records and English books. It is also close to the Korean War Museum, Bukchon Cultural Village, and the Seoul Tower. It is the perfect central location to see a lot of Seoul and still have a lot of fun. I didn’t get into this part of town until later in the afternoon, so I did not have a lot of time to explore, so I went to my favorite place right away, Vatos Tacos. This fusion restaurant takes the parts of Korean food I enjoy and blends them with Mexican to make one of the best meals you can get in Seoul. 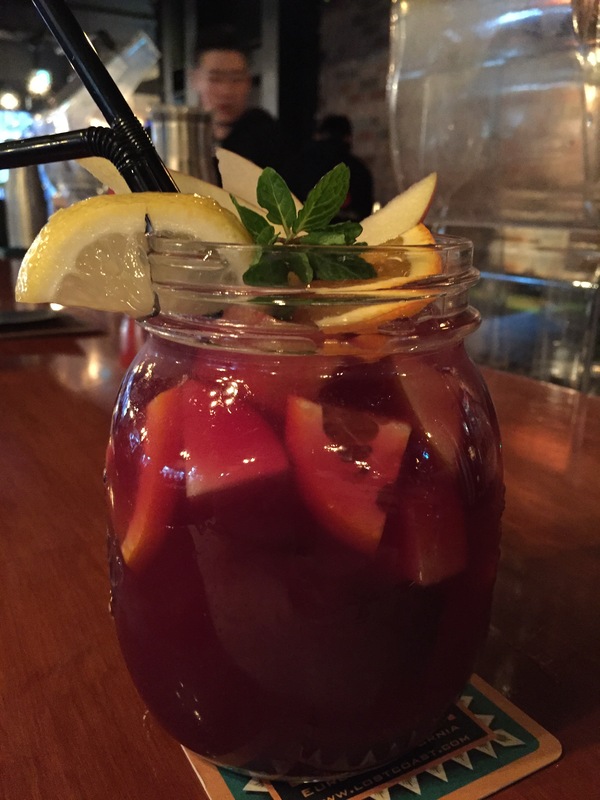 There are a few locations in town, but Itaewon has the first location. Usually I go down to this location and even at 5:30 in the afternoon, I have to wait a good thirty minutes before I am able to get a table, but because of the holiday, I was able to walk right in and find a spot at the bar. There was a steady stream of people who came and went throughout the time that I was there, but it still never filled up the way that it usually does. Even the roads were quiet. Usually the sidewalks would be packed with people, and the roads jammed with cars and taxis. It is the perfect time to come and visit this place, and get the most out of the experience. I am excited for the days to come that will allow me to try some of the other food that it offered, and see a couple of the sights. It will be a nice break from the daily grind because Itaewon is also experiencing a break from its usual grind. Lunar New Year offers a lot of advantages to this part of the world, and I am glad that I am here to experience them.